1. Heat the oil in a large, non-stick frying pan or wok and stir-fry the pineapple pieces over a high heat for 2 minutes until golden. Add the chilli, toss with the pineapple and cook for a further minute. 2. Stir in the vegetables and cook for about a minute before adding the sauce and finally the noodles. 3. 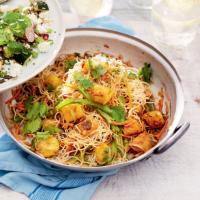 Heat together for 2–3 minutes, stirring until piping hot, then spoon into bowls and scatter with fresh coriander. Serve swiftly.